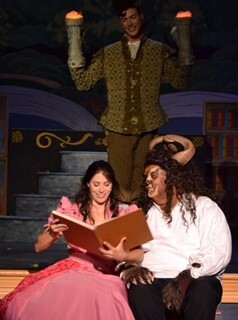 Opening night of Disney’s “Beauty and the Beast” was feverish with anticipation and high energy! Forty minutes prior to curtain time, the enthusiastic children and adult patrons attending the Carroll Arts Theater in Westminster, MD awaited in a sprawling line down West Main Street in hopes of finding the best seats in the house for general admission. Many of the patrons holding beautiful floral arrangements for their special starring cast members to the SOLD-OUT run of the September Song’s theatrical production of “Beauty and the Beast,” August 31st through September 4th. The human storyline of love and how love is not found by the outside appearances, but by the beauty in the heart. A lesson learned the hard way when the Prince, played by Mike Ferrante would not help a poor old lady, only to discover under her dingy brown cloak was a beautiful Enchantress (Erica Hansbrough). The Enchantress was unforgiving and cast a wicked spell upon the Prince and all in the castle only to be broken by true love. Simultaneously, a journey away, an intriguing story is brewing in a little French Village the South of France between a young beautiful Maiden, Belle, played by Alyson Marks and Gaston an overzealous man determined to win Belle’s heart. What happens when the love of your life wants nothing to do with you? Gaston, played by Matthew Lamb gives a strong performance while he is mystified and comical, as he totally ignores Belle’s lack of interest and disdain. The self-absorbed and vain Gaston misses the inner beauty of his heart’s desire. 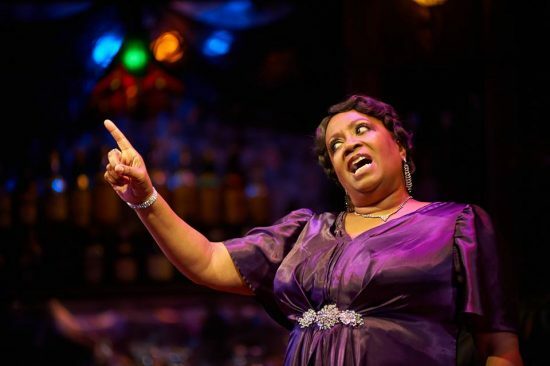 Belle (Alyson Marks) shines in her performance and appeals to your heart. She is fiercely independent, intelligent and “different,” as Belle seeks a life in her worldly books far, far, far away, well beyond Gaston’s imagination! Gaston causes missteps and misfortune accompanied by his loyal friend, LeFou played by Adam Yastrzemsky. Adorned by three Silly Girls (Compton Little, Brooke Nixon, Lillian Stoneberger),Gaston relishes in the towns people fasciation of his outer physique and charisma. The interplay of human insecurities covered up in a cold hearted, domineering, loud mouth desperate love starved Beast was brilliantly played by Michael Livingston. His mere size, long thick curly locks, furry paws, vocals and the artistic face was intimidating and fearful, and heartwarming all at the same time, as he began to expose his gentler and kinder side. His attempts at becoming a gentleman and pleasing to Belle is hilarious! While time is of the essence, the host of talented characters in the castle are so hopeful that the Master will find true love and the spell will be broken. Finally, the charming Tea Pot, Ms. Potts (Melissa Valdiyia) and her son in a cup, chip (Josh Bowden), the glamorous vanity, Spencer Nelson playing Madam de la Grande Bouch can become human again. The comedic relationship and excellent performance between the human clock, Cogsworth (Ethan Brown) and his rival the candelabra, Lumiere played by Jack Merson kept the audience laughing. The Realism of Belle’s loving relationship with her father, Maurice played by Dennis Skinner was authentic and pulls at your heart, as she trades her freedom for his freedom. Later, Belle regains her freedom and is determined to go search and save her father loss deep in the forest. The commitment of the cast showed in the incredible performances by the ensemble, with dances choreographed by Amy Appleby which are creative and exciting and matched by the wide ranges of skilled lighting directed by Tabetha White, and the special effects takes you to the beautiful South of France village, to the deep dark scary forest and the era of the castles, the enchanted rose and mirror all working in concert. The fabulously sparkling costumes and the children customs depicting the time are magical. The audience, including the youngest patrons chewing on starburst candy pulled their legs up into the seats and were simply drawn in and captured by the array of performances, songs and dances. September Song’s fabulous production of the “Beauty and the Beast” directed by Laura-Beth Wonsala received a standing ovation opening night. Running Time: Approximately 2 1/2 hours with one intermission. “Beauty and the Beast” plays through September 4, 2017 at the Carroll Arts Center in Westminster, MD. For information about September Song, click here. Love for the Arts was a gift from Mom! Early exposure to local theatre as a child was truly a gift. Some of her lines are etched forever in my heart and mind. Watching Mom's stage performances in community theatre are great memories. My trips to Broadway shows, lots of dance classes , music appreciation and the fascination with artist and visual arts fostered an understanding that the Arts are the greatest forms of expression to be shared. Currently, my goal and works through the The Society, Inc. of Howard County (www.thesocietyinchoco.org) are to give children the opportunities, as I was afforded to experience and develop a love for the Arts.